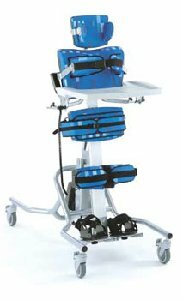 The three-in-one Horizon Stander is a robust, durable, adjustable prone, upright and supine stander. The degree of height and angle adjustability from prone through to supine offers clinicians the tools to design standing therapy programmes for a range of individuals, both in terms of their clinical requirements and age. The Horizon Supine Stander Size 1 is recommended for children ages 5-10 years, weighing up to 110 lbs. (50 kg).